If you’re serious about the trampoline, then it may be time to start challenging yourself with new moves and tricks. This fun pastime isn’t just for kids. It offers amazing physical and mental health benefits and could present an opportunity to prove your prowess in professional competitions. Whether you just want to get fit or plan on going pro, there are a few things you should know as you practice on the trampoline. Trampolining is a high-intensity exercise. The better you get, the higher you will jump. Before you begin, make sure your trampoline is up to the task. Check all parts to ensure that there is no damage or wear. Make replacements as necessary to prevent a malfunction. You may be anxious to get up there and do some impressive routines. As you start out, remember to go slow until you have perfected each move. Take your time and advance once you have mastered the current move. Trying to push forward too quickly can lead to disappointment and even injury. Remember to only take on big jumps with a professional trainer present. If you really want to go all the way, you’ll need the eyes and advice of a good trainer. Find a gym that offers trampoline training or search for someone locally who has experience and can mentor you. 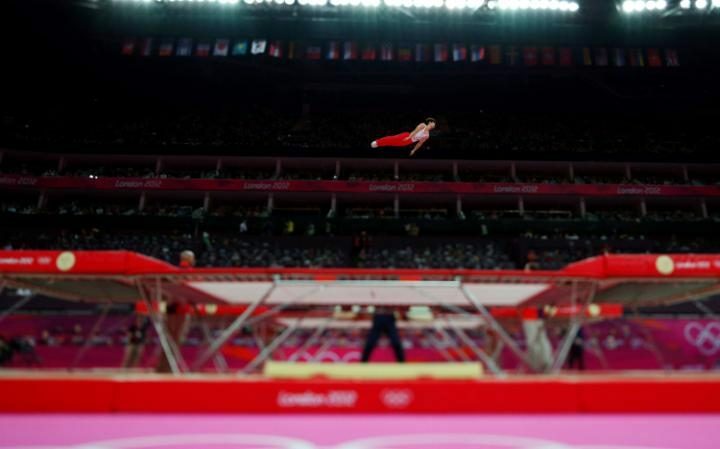 The advice of an athlete will go a long way in your trampoline training. Just like any other high-intensity exercise, you should prepare your body with stretching and a warm-up before you jump on a trampoline. Doing so can reduce the risk of sprains, tears, and other injuries. You should also plan a cool down after the workout that includes stretching to prevent stiffness and soreness later. Your diet determines your physical ability on the trampoline. Make sure you give your body the energy it needs to keep up. Pro athletes must be aware of what they eat as well as what exercises they do. As a safety precaution, make sure you have proper clearance before you start jumping on your trampoline. A general rule of thumb for backyard bouncing is at least 3 feet away from objects and structures with 20 feet of overhead space. Always have a spotter available while you train on a trampoline. This should be someone who is within line of sight and can see and hear you at all times. The first step in trampoline training is finding the right equipment. Topline offers a variety of trampoline sizes, shapes, and designs suitable for the pros. Have a browse of our high-quality trampolines, replacement parts and accessories so you can reach your bouncing goals!